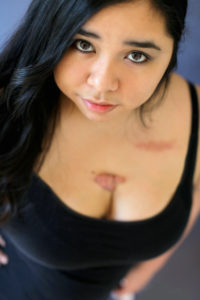 I wanted to share a picture of me my husband took of my scars with you guys. Not many of you know my story or have seen my scars because I often hide both of them. I wish I could tell you when they first told me I had a heart condition (hypertrophic obstructive cardiomyopathy) that I was poised and calm. I wish I could tell you guys that with each scar I braved the surgeon’s hand and went under with faith and tenacity. I wish I could say that the night before I had open heart, I was calm, cool, and collected. I wish I could say that these scars don’t represent who I am and that they don’t cripple me. I wish I could say that I’m healthy and living each day to the fullest. But if I can be completely honest, each time I went under the knife I was scared to death. Each time I questioned the existence of a good God because why would He let me go through something like this. The night before I had open heart, I cried on my living room floor while my friends held me and prayed over me. Every day I wake up with pain on my chest from the scars that have built up extra scar tissue. Some days I want to lay in bed and do nothing because that’s what my body desires. I think this is why they call us heart warriors. We may feel all those things described above but we’re still here. Our hearts are still beating. Warriors are described as courageous and vigorous and through our experiences that’s what we become. We all have a story. We all have something tragic that has happened and we have had big beautiful moments to counteract the hard times. In the moments that I look into my sweet baby boy’s eyes, I remember the good God that held my hand through the surgeries despite my questions. In the moments my husband holds me, I remember the good God that never left my side. In the moments my family brings countless laughters, I remember the good God who brought joy to me in times I felt weakest. In the moments my mom encourages her little heart out to me, I remember the good God whose love is relentless. In the moments when I watch the sun rise above the horizon and pierce through the dark sky, I am reminded of a good God that promises joy in the morning. This is why I am a photographer. I capture the moments that God has let me live another day to see. I love watching families run around and act goofy. I love watching two people become one on their wedding day. I love holding newborn babies and imagining what they’re gonna be when they grow up. Capturing what the marching of time sweeps away too quickly is part of my calling. Thank you for reading my story. I would love to tell yours. Here’s how to apply to be part of The Brave Project.